Kajal or Kohl as it is widely known these days has been used in India since ancient times to add beauty to the eyes. The black colored cosmetic is used to line the waterline of the eyes to define and highlight them. They are so popular in India, that even international brands have launched their Kajal pencils in India. For most Indian women, a kohl pencil or kajal is a must have in their handbag and they do not step out of the house without it. When it is such an important part of your daily grooming, you should pick nothing but the best. Use a kajal that soothes the eyes, has nourishing ingredients and lasts for long hours. To simplify your search for the best kajal out there, we have compiled a list of the top 10 best kajal in India. Take a look at our picks and tell us if you have a favorite among these. The Lakme Eyeconic Kajal is a water-proof and smudge-proof kajal that lasts upto 10 hours after application. It comes in a convenient twist up pencil and is dermatologist-tested to be irritation free. It is priced at Rs. 199 for 0.35 gm. The Maybelline Colossal Kajal comes with a smudge-free 12 hours formula with the deepest black pigments. It is easy to apply and remove. The retractable pencil is precise and glides smoothly to give you a perfect finish. It is priced at Rs. 175 for 0.35 gm. 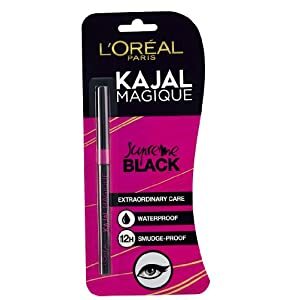 The L’Oreal Paris Kajal Magique is water-proof and lasts upto 12 hours. It is ophthalmologist tested and can be used even if you wear contact lenses. 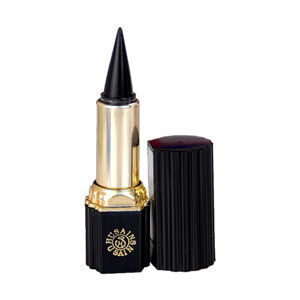 The kajal has vitamin E, cocoa butter and olive oil extracts and has an intense black rich color. It is priced at Rs. 245 for 0.35 gm. The Colorbar Eye Pencil kajal comes in a shade called Blackout. It highly pigmented and has a creamy formula which ensures smooth application and intense color to give you smoldering eyes. The kajal does not feather or bleed. It is priced at Rs. 450 for 1.1. gm. The Revlon Kohl Kajal Pencil is comes with a retractable tip. It provides intense color and a matte finish. It glides smoothly and enables easy application so that you can play around with it and create dramatic eyes. It is priced at Rs. 225 for 1.14 gm. The Biotique Kajal stick is an organic cosmetic made from sesame oil, almond oil, amla and bhringraj. It provides an intense black lining to the eyes and also helps you get thicker eyelashes. The retractable stick is easy to use. It is priced at Rs. 99 for 3 gm. The Shahnaz Husain Sha Eyes Herbal Kajal is a natural kajal made from almond oil and extracts of triphala and other herbs. It relaxes the eyes, promotes growth of thicker eyelashes and defines them brilliantly. It is priced at Rs. 220 for 2 gm. The Himalaya Herbal Eye Definer Kajal is made with castor oil, almond oil, triphala and camphor. It acts as a cooling liner that relaxes and brightens the eyes. It is easy to apply and is long-stay. It is priced at Rs. 120 for 2.7 gm. The VLCC Kajal is made of triphala, licorice, almond oil and camphor. It defines the eyes brightly and does not fade or smudge after application. It soothes the eyes and has a cooling effect on it. It is priced at Rs. 150 for 2.5 gm. 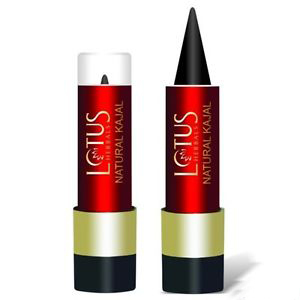 The Lotus Herbals Natural Kajal is 100% natural and is made with botanical extracts like camphor and almond oil. It nourishs your eyes, cools it and improves the thickness of your lashes. It is priced at Rs. 125 for 4 gm.